After recent polls showed that trust in the media is at an all-time low of 32 percent, two UO journalism instructors decided it was time to find out why. A $25,000 grant from the Agora Journalism Center at the UO School of Journalism and Communication allowed Heyamoto and Milbourn to launch the 32 Percent Project in 2017. 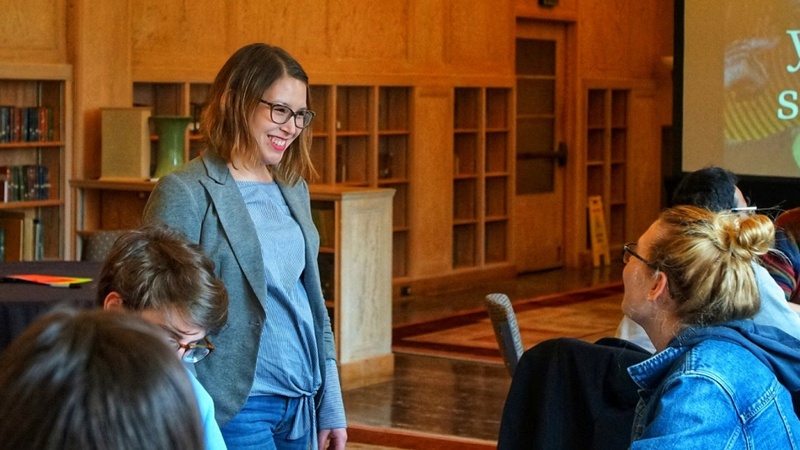 Last summer, the two journalists, who are married, hosted workshops across the country in diverse communities, including several rural towns, to find out what drives and disrupts trust in news organizations. Based on what they learned from more than 100 participants, the researchers identified six key factors for building trust in news: consistency, transparency, authenticity, diversity, positivity and a sense of a shared mission. These initial insights are part of a broader report the group will release later in the year. The researchers hosted the workshops in public libraries in California, Illinois, Massachusetts, Mississippi and Oregon with assistance from Thomas Schmidt, a post-doctoral researcher in media studies at the UO. During each session, they presented a series of prompts, which participants explored during an open discussion. They invited people from all backgrounds, education levels and political persuasions to join the workshops to discuss the factors that lead them to trust — or distrust — news organizations. Milbourn and Heyamoto found that community members trust media outlets more if there is consistency in their reporting and if the audience knows what to expect. And transparency is critical. Milbourn said that while many journalists might feel they’re being transparent about their work, few consumers understand the process. The team also found that people tend to trust news organizations that reflect what life is truly like in their community, rather than those that simply drop in to report crimes and other negative news. “People want to hear stories that capture the good things going on — not simply stories on puppies and rainbows, but ones on the real work that’s happening to make their community a better place,” Milbourn said. The need for diversity is another theme that emerged across every community the researchers visited. In matters of race, gender, class and geography, participants said they didn’t see themselves reflected in the people producing and reporting the news. In California, for instance, one participant said she doesn’t trust the local TV news because the anchors are too polished and don’t look like people she sees on a day-to-day basis. Milbourn and Heyamoto said the media can learn many lessons from the 32 Percent Project’s research. One takeaway is that journalists must do a better job explaining why they’re covering a particular story and how they’re collecting the information. Another idea is for news organizations to hire local journalists who live in the communities they cover and have a stake in their success. “We see ourselves as a bridge — collecting voices and perspectives from these communities and really connecting with the news organizations that serve them,” Heyamoto said. Milbourn and Heyamoto have recently conducted similar workshops for UO students as part of the Freedom of Expression Series, a university-wide series focused on nurturing inclusive campus conversations. On Feb. 23, they hosted the “Your Campus, Your Voice: Student Roundtable,” and they will host a second student roundtable on the same topic on March 9 from noon to 2 p.m. The two faculty members are now writing an analysis of their findings for the Agora Journalism Center and academic publications. They’re also talking directly with news organizations and other researchers about other ways to collaborate and put the findings into action. The team presented its findings in October at the Online News Association Conference. Team members will also speak at the International Association for Media and Communication Research conference, held on the UO campus June 20-24.